An informal poll completed by a couple hundred Mitchell webinar listeners Thursday found bullishness on 2015 Ford F-150 sales but an overwhelming prediction that the aluminum truck would have higher repair costs. The audience was slightly more split on whether insurance rates would climb for the new F-150, with 65 percent of the respondents — webinar presenter Greg Horn estimated 77 percent of the approximately 500 attendees voted — saying yes. Four percent said no, which seemed to imply rates would in fact lower as 31 percent voted that rates would stay the same. Both Horn, who is Mitchell’s vice president of industry relations and data analytics, and insurers have cautioned that there’s not nearly enough 2015 F-150 data to predict repair cost or insurance rates, respectively. “There’s just not that many that are involved in wrecks so far,” Horn said. Still, the audience — which presumably included numerous representatives from the collision repair and auto insurance industries — still felt the aluminum truck would cost more to repair, with 92 percent voting yes and 8 percent saying no. This response could be taking into account higher aluminum repair rates compared to steel ones, something seen by repairers as appropriate to recoup the tens of thousands of dollars in possible training and equipment needed to handle aluminum. Plus, aluminum is trickier to manipulate than steel; this was shown recently in Farmers’ reiteration that it pays the PDR industry more for aluminum repair after a regional Farmers employee erroneously said otherwise. Ford disputed the IIHS findings. Its position remains that a properly trained and equipped shop should be able to repair an aluminum F-150 panel at the same time and cost as a steel one, thanks partly to the truck’s modular, remove-and-replace procedures. The IIHS and Chevy also recently made headlines arguing the opposite, the former with F-150-on-F-150 crashes and the latter an ad featuring Howie Long. 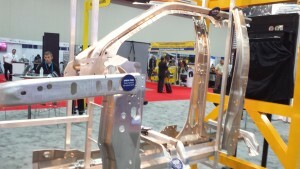 As for sales, 73 percent of respondents felt that the 2015 F-150’s aluminum wouldn’t hurt F-150 purchasing. Earlier in the webinar, Horn analyzed Ford’s move to offer up to $10,000 rebates, which a Kelly Blue Book analyst told Automotive News in July could eventually signal a deeper demand problem for the truck rather than a lack of supply. But Horn dismissed that idea, pointing out the F-150’s quick turnover times and $44,000 average transaction price — $3,600 above average. What was likely happening, he said, was the fact that automakers typically release option-heavy versions of the new model year to lots first to attempt to upsell customers. (Ford earnings calls have indicated high interest in the more loaded variants of the F-150.) Horn said Ford’s incentives were likely part of that strategy as well. Still, he pointed out that the Silverado is up 17.5 percent for the year compared to Ford’s -1.3 percent — a discrepancy because of production ramp-up, he said, echoing Ford, whose Kansas City-area plant was as planned still being prepared for the truck in the first part of the year. Automotive News has also reported the company has frame issues — which Ford won’t acknowledge — most recently reporting that a second supplier had been contracted to produce them. He also noted General Motors did have bragging rights over Ford if you counted GMC Sierra and Silverado sales together; that’d make the company No. 1 in July. Mitchell industry relations and data analytics Vice President on Thursday took informal polls of webinar audience members on factors related to the 2015 Ford F-150.